Summer has arrived, and we&apos;re ready to celebrate all that screams &apos;tis the season in Los Angeles. From sand to summit, from sips to snacks — we love L.A. summers. Even years after school, summer is a season that can turn the brain of even the most serious adult into mush. But while those daydreams about a Hawaiian vacation might be more fantasy than reality, museums will help keep your brain in a solid state while providing more entertainment value than you might imagine. These five exhibits highlight some of L.A.&apos;s less heralded pioneers and locations with photographs, videos, and all sorts of other interactive features. So quit daydreaming and drop by a museum. It&apos;s good for the brain, light on the wallet, and more worthy of your time than the average cable marathon. Along with swimming pools and cargo shorts, hammocks are one of the ultimate symbols of suburban summer leisure. But Thai artist Pinaree Sanpitak recontextualizes the hammock with more cultural significance in her LACMA exhibit Hanging by a Thread. During the 2011 monsoon season in Thailand, royal relief efforts distributed the traditional Thai cloth paa-lai to those affected by flooding. 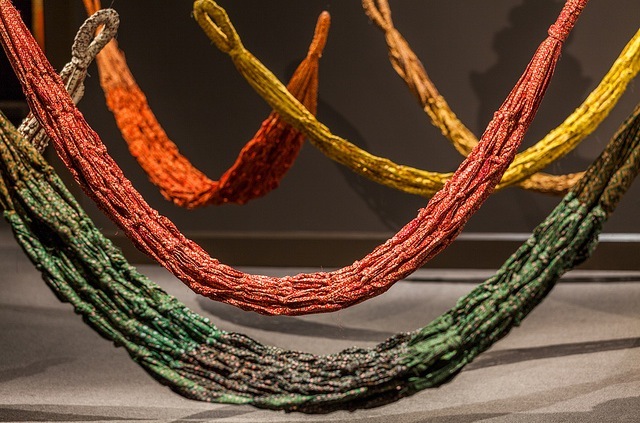 Displaced by the floods herself, Sanpitak used the time out of her art studio to create 18 paa-lai hammocks, all of which are now hanging in the Ahmanson Building at LACMA. In addition to their connection to Thai history, the hammocks invoke feminine themes like "fertility, sustenance, comfort, and refuge." Pinaree Sanpitak: Hanging by a Thread runs through September 29. General admission is $15 for adults and $10 for students and seniors. Children under 17 are admitted for free. LACMA is open from 11 a.m. to 5 p.m. Monday, Tuesday, and Thursday; 11 a.m. to 8 p.m. Friday; and 11 a.m. to 7 p.m. Saturday and Sunday. LACMA is closed on Wednesdays. When the L.A. Times checked back on a 1988 article published in their magazine predicting life in 2013, reactions were simultaneously impressed (teleconferencing, GPS in cars) and incredulous (robot butlers? "new fangled Indian cigarettes?") at engineer and current USC professor Jerry Lockenour&apos;s bold predictions. But even if you let out a couple of Mitt Romney-esque guffaws at the piece, it&apos;s difficult to deny the unpredictability of Los Angeles&apos; innovations. Overdrive, a new exhibit at the Getty Center, highlights the city&apos;s radical changes from 1940 to 1990 that led to today&apos;s eclectic collection of malls, skyscrapers, and homes. Stop by and view the various photographs, movies, and models from fifty years of L.A. cityscape and wonder where the next fifty years will lead us, robot butler or not. Overdrive runs through July 21 in the Exhibitions Pavilion at the Getty Center as part of Pacific Standard Time Presents: Modern Architecture in L.A. Admission is free, though parking is $15. The Getty Center is open Sunday and Tuesday through Thursday from 10 a.m. to 5:30 p.m and 10 a.m. to 9 p.m. Friday and Saturday. It is closed on Mondays. If you&apos;re hoping for the inside dish on the baseline for "Billie Jean" or what it&apos;s like to be Rashida&apos;s father, you&apos;re thinking of the wrong Quincy Jones. A. Quincy Jones is a renowned architect that built over 5,000 housing developments in the mid-20th century, many of them still standing today. Now the subject of his very own exhibit at the Hammer Museum, Jones&apos; body of work now has a chance to shine, featuring drawings, photographs, and a "case study house model." Take a day to get well-versed in Jones&apos; concept of "better living." A. Quincy Jones: Building for Better Living runs through September 8 at the Hammer Museum. The museum is open Tuesday through Friday 11 a.m. to 8 p.m. and Saturday and Sunday 11 a.m. to 5 p.m. The museum is closed on Mondays. General admission is $10. Seniors and UCLA alumni get in for $5. Children and students get in free. After Jenni Rivera&apos;s untimely death on December 9, 2012, the media struggled to assign significance to a woman who was obscure to the mainstream but a superstar in the world of banda music. Now the Grammy Museum is dedicating an exhibit to Rivera, with the express intent to pay tribute to the "Diva of Banda." Jenni Rivera: La Gran Señora makes the case that Rivera was not only an artist who sold gold and platinum records to legions of adoring fans, but a socially conscious singer who dispelled female stereotypes with her lyrics and celebrity. 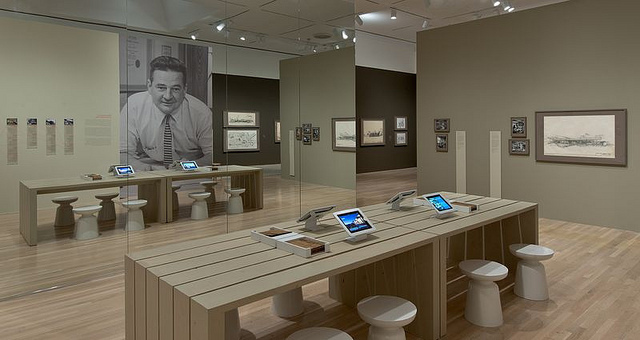 Featuring photographs, memorabilia, videos, and more, the exhibit explores why Rivera was a such a titan in her industry. Jenni Rivera: La Gran Señora is open through May 2014 at the Grammy Museum. The museum is open 11:30 a.m. to 7:30 p.m. and Saturday and Sunday from 10:00 a.m. to 7:30 p.m. General admission is $12.95 for adults, $11.95 for seniors, and $10.95 for children 6-17. Children under 6 get in free. It&apos;s extremely difficult to gain commercial success and creative respect in Los Angeles, but if anyone&apos;s walked the proverbial tightrope, it&apos;s artist Gary Baseman. While many will recognize his work on the Disney cartoon Teacher&apos;s Pet and the board game Cranium, Baseman has also produced a prolific collection of fine art that explores his Jewish upbringing. The Skirball Cultural Center exhibit Gary Baseman: The Door is Always Open gives equal regard to both sides by featuring commentary from the man himself. Each part of the interactive exhibit is introduced with a video from Baseman as museum goers walk through recreated rooms from the artist&apos;s past and current life, including a bedroom, backyard, and studio space. 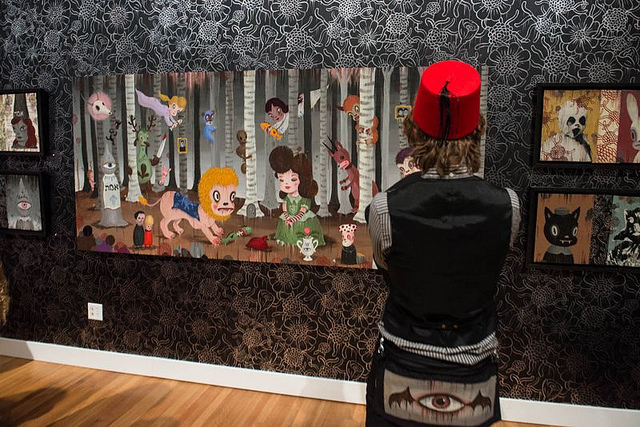 Gary Baseman: The Door is Always Open runs through August 18 at the Skirball Cultural Center. The museum is open 12 p.m. to 5 p.m. Tuesday through Friday and Saturday and Sunday from 10 a.m. to 5 p.m. The museum is closed on Mondays. Admission is $10 for adults, $7 for seniors, students, and children over 2 to 12. Children under two get in free.